Lionsgate Home Entertainment has announced the US release date for the Swiss Army Man DVD and Blu-ray. It will hit shelves on 4th October 2016. Golden Globe® Nominee Paul Dano (Love & Mercy) and Daniel Radcliffe (Harry Potter franchise) star in the “bold and original” (Chicago Sun-Times) Swiss Army Man, arriving on Blu-ray (plus Digital HD) and DVD (plus Digital), October 4 from Lionsgate. Written and directed by acclaimed music video directors Daniel Scheinert and Daniel Kwan (collectively known as DANIELS) in their feature film debut, the “wild and inventive” (The Huffington Post) storyfinds a hopeless man stranded in the wilderness who befriends a dead body and together they go on a surreal journey to get home. 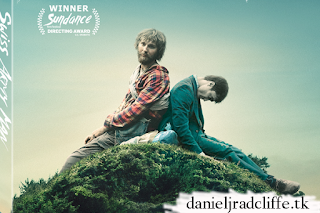 Winner of the 2016 Sundance Film Festival’s directing award and a New York Times Critics’ Pick, Swiss Army Man also stars Mary Elizabeth Winstead (10 Cloverfield Lane) and features music by Manchester Orchestra members Andy Hull and Robert McDowell. 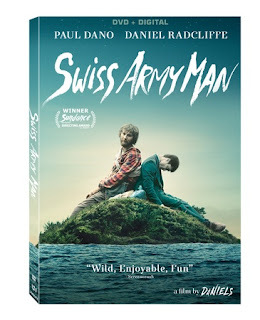 The Swiss Army Man home entertainment release includes a music-less audio track along with Q&A with the filmmakers, two behind-the-scenes featurettes, audio commentary with DANIELS and crew and deleted scenes. The Blu-ray Disc of Swiss Army Man will feature a Dolby Atmos® soundtrack remixed specifically for the home theater environment to place and move audio anywhere in the room, including overhead. Swiss Army Man will be available on Blu-ray (plus Digital HD) for $24.99 and DVD (plus Digital) for $19.98. Title Copyright: Swiss Army Man © 2016 Ironworks Productions, LLC. All Rights Reserved. Artwork & Supplementary Materials © 2016 Lions Gate Entertainment Inc. All Rights Reserved. DVD Audio: English 5.1 Dolby Digital Audio, Music-Less Track with Filmmaker Intro.